Newly installed PA/CIS Board at the Middletown Road station. Photo courtesy of MTA New York City Transit. 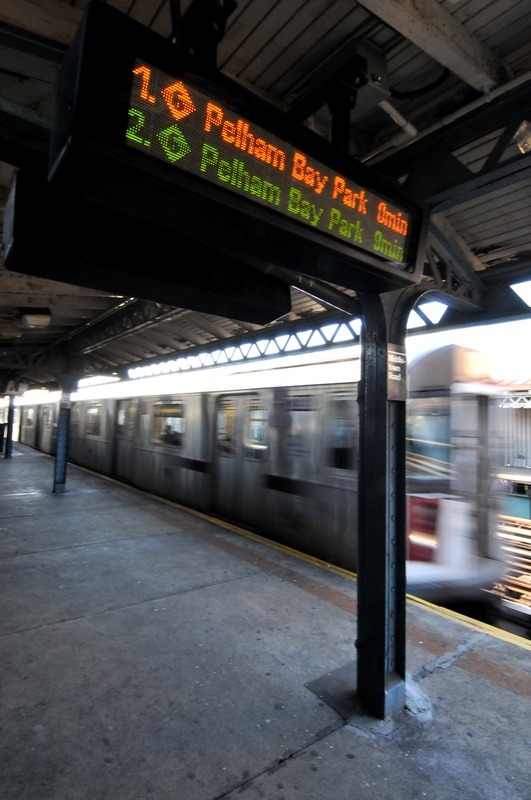 MTA New York City Transit officials today announced that real-time train arrival message screens are now operational and being tested in the Buhre Avenue and Middletown Road stations on the 6 line. The Public Address Customer Information Screen (PA/CIS) provides train arrival messages in audio and video. The messages indicate when the next two trains are due to arrive at the station and their destinations. Though still in the testing phase, this marks an important milestone in the effort to provide MTA New York City Transit’s subway customers with up-to-date travel information employing 21st Century technology. It is also a major component of the Metropolitan Transportation Authority’s effort to substantially upgrade customer communications across its entire network. Aside from train arrivals, the system also allows NYC Transit to provide both audio and visual messages to customers, keeping them fully informed about service delays or emergency situations. PA/CIS will be rolled out incrementally with 152 stations on the numbered lines operational by the first quarter of 2011. PA/CIS was first introduced along the Canarsie L line in January 2007. The information distributed through the PA/CIS system originates from NYC Transit’s Rail Control Center (RCC). From the RCC, Customer Service Agents provide subway customers with service status and other information either as audio only, visual only, or as synchronized audio and visual information. In addition to Buhre Avenue and Middletown Road stations, PA/CIS equipment is also operational in the Brook Avenue, Cypress Avenue, E.143rd Street-St. Mary’s Street, E. 149th Street and Longwood Avenue Stations, as well as all the stations on the L line. The system includes signs and speakers which are located on the platforms and in the fare control areas prior to entering the station. PA/CIS will be activated in more stations throughout the coming weeks. The announcement of this is good timing as I have been meaning to write an entry about them. I took a visit to a station along the 6 recently to photograph them in action for Eye On Transit. I took a few photos & will share my thoughts later tonight.